We accept, cash, checks that are good, credit and debit cards. We will be charging a 3% fee for credit card use. Please enter through the front door-exit and pay through the garage. Please reserve the garage door driveway for loading and unloading. We are very limited with help for this sale. We will not be able to assist with loading items. Please bring people to help with loading-or make arrangements to have help. Bring bags and boxes. Children of today are the shopper of tomorrow. We love to have children attend out sale. Because of unusual circumstances, our homeowner has ask for no pets. Thanks for being understanding about that. Numbers will be given out one hour before opening the door. Old. 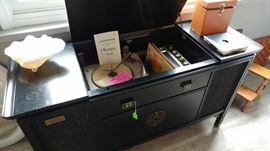 Radio still plays extremely well, turntable turns on, but will not rotate. The cabinet itself is unusual-asian motif. Just a good, old piece waiting for a new home. Uh, how many Fiesta pieces can you count? Jon Shaw. Mid century English artist. Nautical print. Sturdy, old wheelchair, reminiscent of the FDR era. 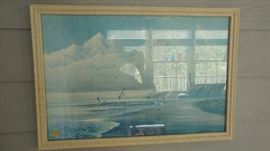 Frame, easel, artwork are at least 120 years old, according to our homeowner. Don McWhorter pottery. Carrollton, GA award winning potter. Several pieces available. 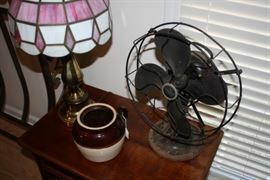 Old Emerson fan, from way back when. Bean pot. Table comes from Alexander Julien-remember him and his wild shirts? He also made furniture. 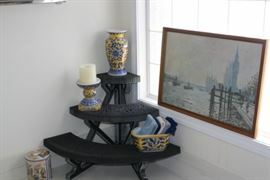 Really nice, plastic shelf from the bathroom with some Asian pottery. 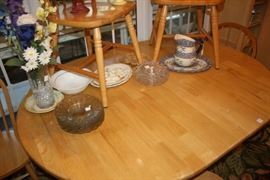 This table and six chairs are in the eating area and are in especially good condition. Nice, relaxing chair. Carpet at the bottom of the photo. 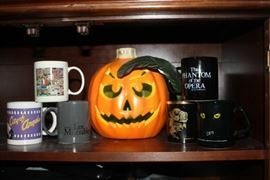 Six mugs, all from Broadway shows that came to Atlanta; Cats, Phanton of the Opera, City of Angels, Les Miserables, two more that I don't remember, plus a lighted pumpkin that is green inside. 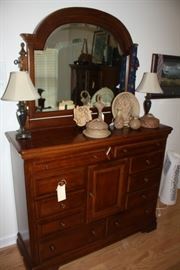 Very nice dresser made by Alexander Julien, came from Rich's. Very nice dresser, unless you want to put your undergarments on the right side and then invite your in-laws into your bedroom. So, back in the 1960's, when 45's were all the rage, you had to have something to put them in to carry them when you went to the sock hop. Here it is. A second old Underwood typewriter. Great designer piece. The second bedside table from Alexander Julian. Old, wooden desk chair. 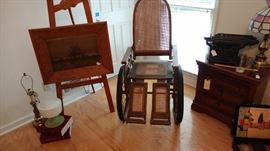 Small step stool, and easel with oil painting. 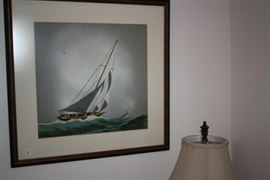 The easel and oil painting were a gift to our homeowner's parents. The wife painted the art work, and the husband carved the frame and created the easel. Our homeowner says they are over 120 years old. Better photo of the easel, frame, and artwork. Another oldie. Singer Sewing machine in what is probably is't original cabinet. Another great designer piece. Six shelves of food, all to be sold at prices that will make you want to drool. Only one or two things priced over .50. Some things that are unique. Emmet Kelly, limited edition cooke jar from Flambro. Look up the prices on line. Great dry sink. Came from either Rich's or Davison's-I don't remember which. Great condition. 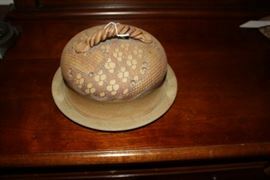 Don McWhorter is a nationally known potter from over in Carrollton, GA These are samples of some of his better known work. Quality stuff. 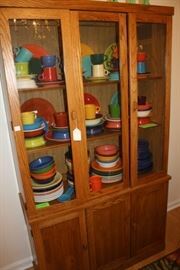 An entire china cabinet of Fiesta. Variety of pieces, variety of colors. Very colorful and fresh. Very few boo-boos. The white plates are very early. They have the word "original" written on the back, along with Fiesta USA. I have never see a piece like what I assume is a spoon rest by Fiesta. Nice little cabinet. Tall and thin. Very nice sofa, love seat, and ottoman. Very nap-pable. I can guarantee that. Cushions will go with the sofas. The khaki color will go with just about anything. Noritake, place setting of 8. Pattern is DAWN. Book ends are nicer than the books, even though the books will look good in a library. Probably either McCoy or Brush. 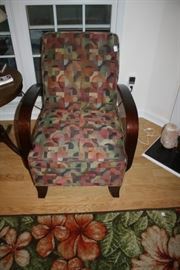 Rocker is old, cane bottom, and in very good condition. I don't know what to call the shelves because the top tilts. Another quality item. Service for 16- something unusual to find nowdays. The pattern is King James, by Oneida, 1947 Rogers (I think). Rarely used, and in good condition. One of several shelves of blue. The ones on the left might be Blue Willow pattern. All I see on the back of these Christmas plates are the words "Christmas Collection" and "Japan". It a set of Christmas dishes with the traditional Christmas tree plus gifts on the front. Don't overlook the coffee table by focusing on the plates. I don't remember how many plates. Great condition-I saw no nicks or chips. Four very nice, blue velvet chairs that are appropriate for a dining room or formal living room. Mid-century oval coffee table with the leather top that was so popular. Chocolote pot and cups with saucers o top. The chololate service is incomplete, but nice. Nice chair. Designed for the full sized person. Here are the Gone With the Wind plates. There are a goodly number of them and we are pricing the at $5 each. Been in the original shipping container since they arrived in the house. One of the best pieces in the house. To us, it is a desk. Mid-century, excellent condition. Came from Rich's.